Indian e-commerce industry is going through a lot of mergers and acquisitions. Amazon is trying to run ahead of Flipkart, the current leading of online shopping in the Indian market, by using its huge cash reserve. Paytm Mall too is burning through a lot of cash. A few companies like Snapdeal are trying to be reborn from ashes by focussing on profitability rather than on burning any more of their cash. The only happy part of this ecosystem is the Indian consumer who is getting great deals and huge discounts. However, one thing that has changed over a few months or rather years now is that it is quite difficult now to find good coupon codes for shopping on these websites. My personal experience says that while coupons still work on payment apps like Paytm, PhonePe and on food ordering apps like Swiggy and Foodpanda; coupons no longer work on e-commerce like Flipkart, Amazon.in, Snapdeal, etc. Rather than coupons, companies now directly show you all the promotional offers that they are running and you are free to select any one of them on the Review order page itself. This is probably a sign of maturity in the Indian e-commerce space. 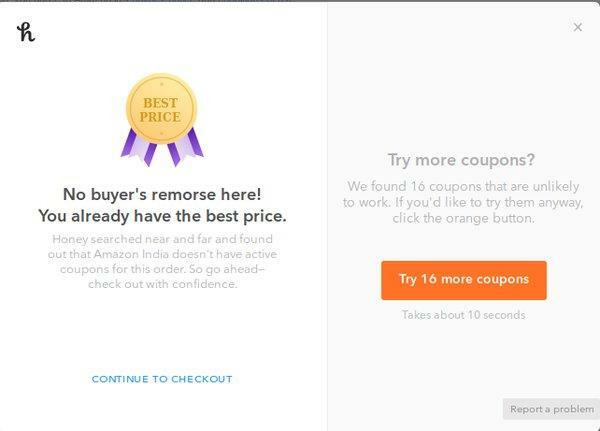 In this age when it is next to impossible to find any coupon that you can apply to get a greater discount, how does it sound to you if I tell that there is a particular browser extension that can try multiple coupons codes collected courtesy of the shopper community and see what is the best discount you can get? Yes, this is what a new start in the US is trying to do. The name of the startup is Honey and it is headquartered in Los Angeles. The company was founded by Ryan Hudson. As per the interview he gave to LATimes, the idea of such a service came to Ryan when he was ordering Pizza for his kid. He didn't have time to waste looking for coupons when his child was hungry. He was struck with the idea that how good it would be if this process can be automated and without going away from the page all different coupon codes could be applied and the best one selected. The result of this experience has culminated in a browser service based extension. The extension is available for Google Chrome, Mozilla Firefox and Safari. Since the customers don't have to navigate to any other page, chances are high that the customer will complete the transaction at the best price which is good for both the consumer and the seller. The extension works in multiple countries currently - the US, Australia, some countries in Europe and recently in India. It depends on community contributions to add new coupons and remove old ones which no longer work. In addition to the extension, Honey also operates a website promoting different products and earns commission through these sales. The earning through affiliate marketing is split between the company and the consumers through a rewards program called Honey Gold. The website however currently shows products only for the US consumers with price in USD. A lot of work is still to be done to make the service global. I tried the extension on 3 Indian e-commerce websites - Flipkart, Amazon and Snapdeal. However, Honey was unable to find any coupon which could offer me any better discount. An excuse I am ready to give to Honey right now is that since it is still new to the Indian market, the community contribution to Honey might not be much. Due to this, it might not have any working coupon codes. With time and more user base in India, it might get better as it has in other countries, especially the US. For Amazon shoppers, Honey has a special offering called the Droplist. This feature tracks the price of a particular product and alerts you if there is any price drop. Currently, the service is available only on desktop browsers. A quick look at their Facebook page shows many users asking for mobile applications and Honey representatives replying that mobile application is currently under development and will be available shortly. The launch of app too will be first for the US and then they will go international.